The baroque key feature is an affected moldings, numerous decoration and gilding. The customer wished to make this type of decoration the most acceptable. 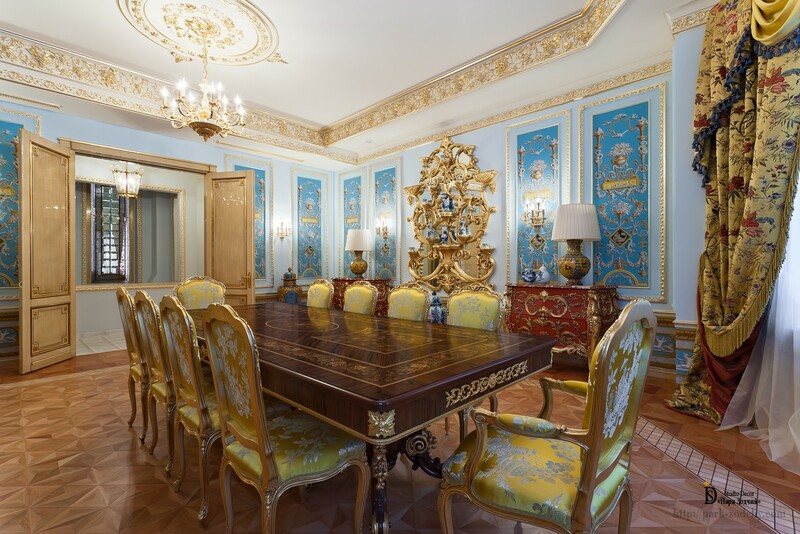 The baroque dining room became something special, bright and appealing. 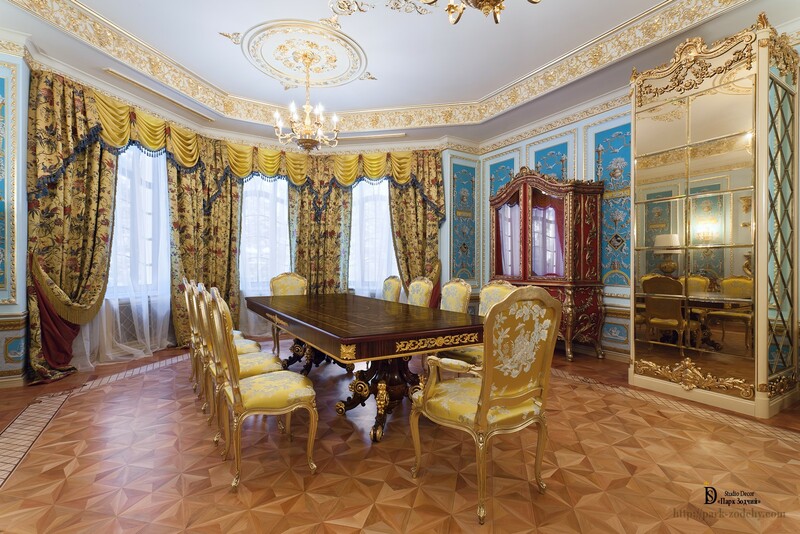 At first, the interior may seem as a garish and rasping combination of different furniture and have too many details, however, it was the customer’s choice. A non-standard dining room form required special decoration skills and experience. It was necessary to create and execute roof casings and oriel projection; to combine finishing and furnishing, moldings and illuminating devices. Roof casings are decorated with complex plaster cornice. Delicate stucco gilding hasn’t overloaded the interior and only pointed out the exclusive stucco design. Grotesque mirrors have created a rhythmical allover. 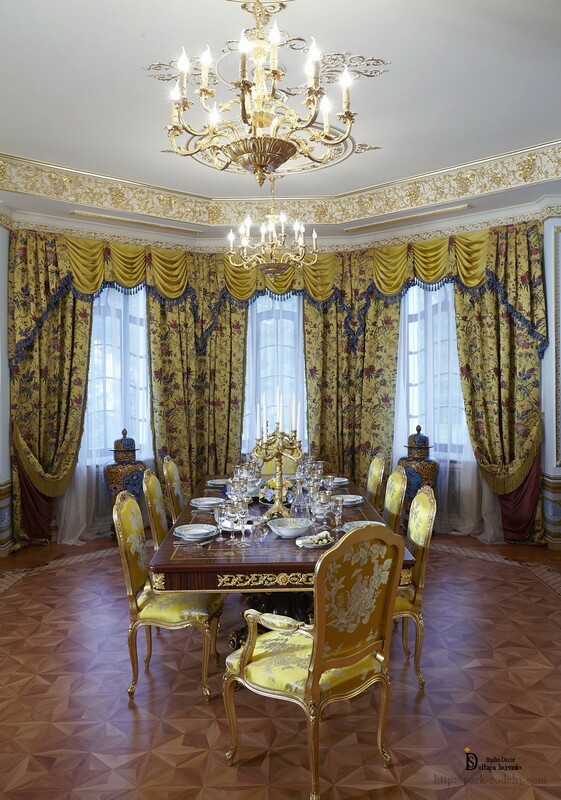 Someone can find it repetitive, but a general interior perception was in a complete accord with customer’s view about dining room arrangement and decoration. 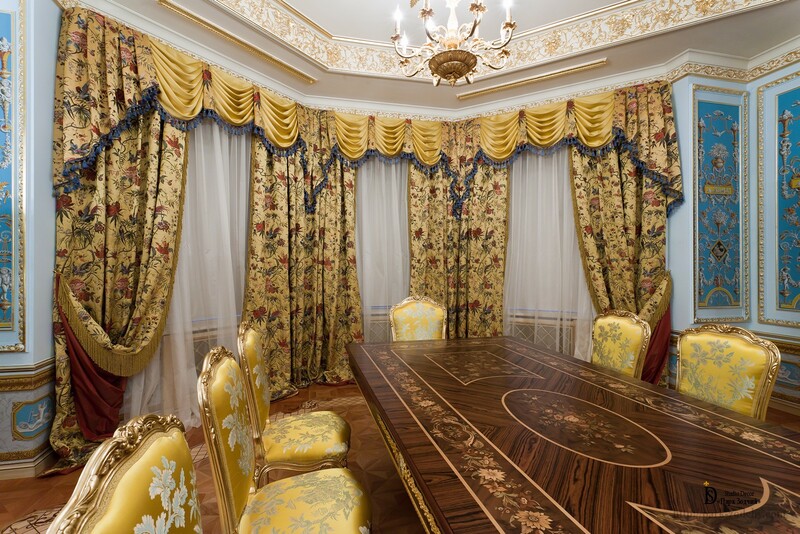 The one interesting and attractive detail has made the dining room a really magnificent. 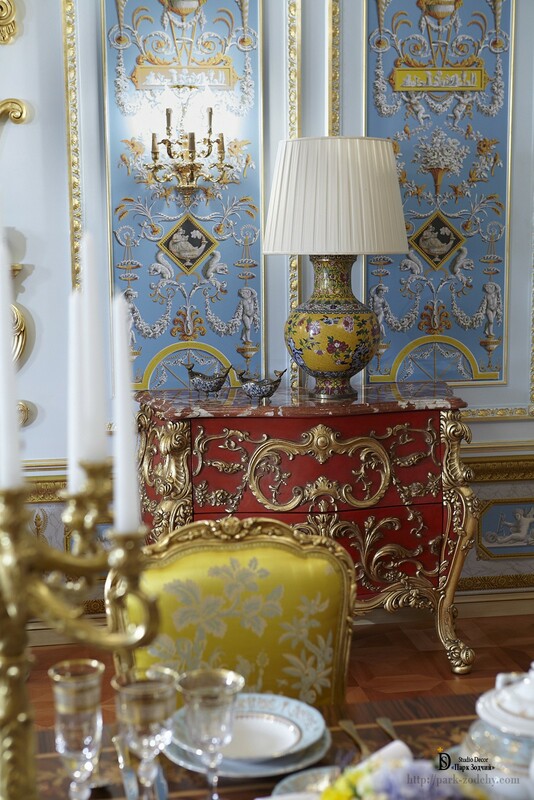 The molding can be hardly called a mirror: a gilded ornamental script reflects vases, roof and walls effectively linking the interior together. As mentioned above: the plaster cornice has become a character element of trim switching from walls to roof. The similar way a floor was arranged. A glamorous glued-laminated parquet has different color shades and is decorated with friso that is shaped similar to cornice. The selected baroque style is quite complicated, so to bring it to life special proficiency is necessary, because items are florid, gilding is sophisticated and painting is complex. Additionally, it was important to consider customer requests: to add blue color to interior and add some furniture items. 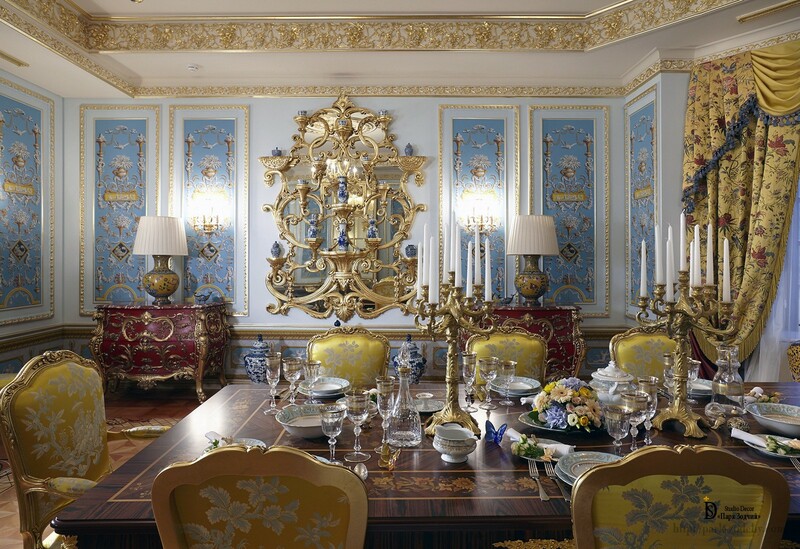 A blue color in classic baroque dining room can raise questions. However, if the customer is delighted with such color palette, it shall persist in decoration. 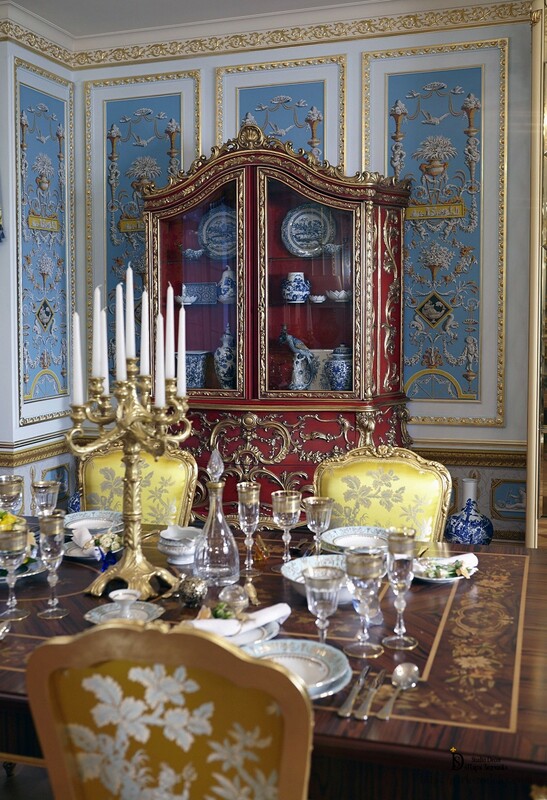 Despite of the fact that a combination of blue and gold colors in any interpretations is not a classic of genre, because the décor balance has been lost, however: gilded moldings, wooden furniture items, fastidious alfresco painting of architectural mirrors on the blue background has created spatial and pleasant aura. Potentially, the mirror wardrobe stays beyond the decoration character. However, the customer insisted on its’ presence in the interior. As it is known the customer’s requests come before everything else. It also shall be noted that the comprehensive decoration with gilded ornamental script support the racked style of premise and reflecting surfaces make it gravity-free, seems it dissolves within the interior.